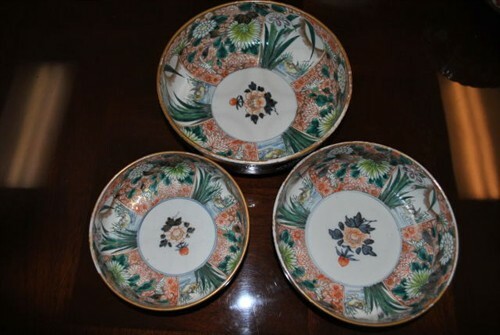 This is a beautiful set of three bowls, one fits inside of the other as seen in photos. There is a multi floral and bird design on all three and there is a maker mark on the bottom of each. The size of the largest bowl is 10″ wide and the second is 8.5″ wide, the third is 7 1/4″ wide. These are from a very fine estate in historical Kennesaw, Ga. near Atlanta. We bought the estate of a full bird US ARMY Colonel. He had been stationed in Japan and many other countries. He bought these antique bowls in the 70’s.